Glamorous woman receiving fingertip head massage, lying smiling on mat with masseuse hands only. 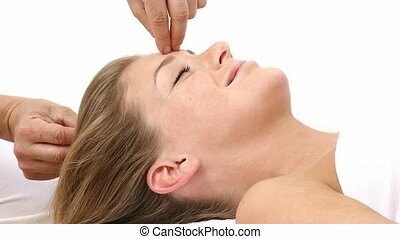 Head Massage In Spa, female hands massaging the forehead and temples of a relaxed beauty. 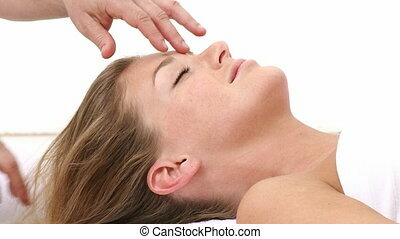 Beautiful Lady Having Head Massage lying on mat with female hands massaging forehead and temples. Spa Treatment Head massage high angle view with hands of female masseuse. Smiling Glamorous Lady Applying Lipstick in a shade of pink, close up. Total Relaxation At The Spa, a lady rests contentedly at the spa while receiving a back massage. Flawless Complexion Skincare Concept, with glamorous blonde lady touching her face with her hand. Skincare Cleanliness And Hygiene, glamorous model removes impurities on her skin using a cotton pad.